The New Year is an emotional time for everyone. Anticipation and happiness as well as anxiety and sadness are often overwhelming for people of all ages. Whether you set New Year’s resolutions or not, there are always high expectations and hopes of what is to come with the state of the new calendar year. This year, try borrowing a concept from Dialectical Behavioral Therapy (DBT) and focusing on your Wise Mind. One of DBT’s basic premises is that there are 3 states of mind…. Reasonable Mind, Emotional Mind and Wise Mind. Reasonable Mind: A person uses their Reasonable Mind when they approach a situation intellectually. They plan and make decisions based off of facts. Emotional Mind: The Emotional Mind is used when feelings control a person’s thoughts and behavior. They might act impulsively with little regards to consequence. Wise Mind: The Wise Mind refers to a balance between the reasonable and emotional halves. A person in Wise Mind is able to recognize and respect their feelings, while responding to them in a rational manner. 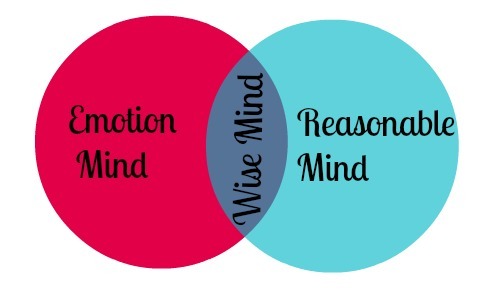 If you were looking at a Venn diagram, Wise Mind would be the overlap of Reasonable Mind and Emotional Mind. Most people gravitate either towards Reasonable Mind or Emotional Mind as their status quo. As such, a person’s first step to acting from the Wise Mind is to identify and become aware of which half is more present for him/her. In DBT, this awareness is called Mindfulness. Mindfulness is the present-moment-focus and quality of awareness that a person brings to everyday living; learning to control your mind, rather than letting your mind control you. Mindfulness as a practice directs your attention to only one thing, and that one thing is the moment you are living in. Once you are clear on which half you tend towards, you can start to make choices to bring your actions closer to the middle path and made decisions with your Wise Mind. So, as you start 2017, become aware of your thoughts and emotions related to the New Year. Try to identify which expectations and hopes come from a Wise Mind place as opposed to an Emotional Mind or Reasonable Mind. And, start a Mindfulness practice in order to become more present in the moment and be able to choose different behaviors for 2017 than you did for 2016.